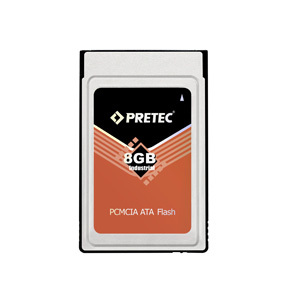 On this page, only the Pretec PCMCIA ATA Flash Cards are listed. [Please click the links above for other brands.]. Packaged in PCMCIA Type II (5.0 mm thick) plastic or metal housing, Pretec Lynx series ATA flash PCMCIA memory cards are available from 128MB to 8GB and in industrial standard temperature grade (0°C to +70°C) or industrial extended temperature grade (-40°C to +85°C). Free plastic travel case is provided. * ETA: expected time of arrival. If ETA date is not listed, the lead time is about 2-3 weeks after customer places order. Please click "Add to Cart" or contact Sales Department at sales@amtron.com or (323) 265-8076 to place order. * End-of-Life (EOL). The manufacturer stops producing this product. 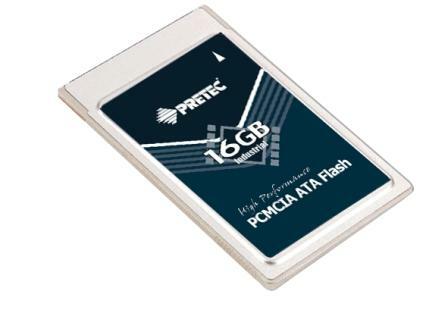 Please order Pretec Lynx series PCMCIA ATA flash PC cards.